THE CAREGIVERS' LIVING ROOM A Blog by Donna Thomson: What Does a Caregiver-Friendly Society Look Like? What Does a Caregiver-Friendly Society Look Like? My husband and I just got home from a trip abroad (in my last post, I talked about the benefits of respite!). We visited London, Wales and north eastern Spain. It was a great break, but it was wonderful to come home, too. Over the last two days, we've binged on visits with Nick and this Monday, I leave to visit my Mom in Montreal. Life is good and everyone is healthy - touch wood! I've been thinking about the way of life in Europe and how it's friendlier to families and caregivers. Maybe it's the weather, but people are outside more - they walk rather than drive. Shops are small and specialized, so that means more opportunity for conversation. 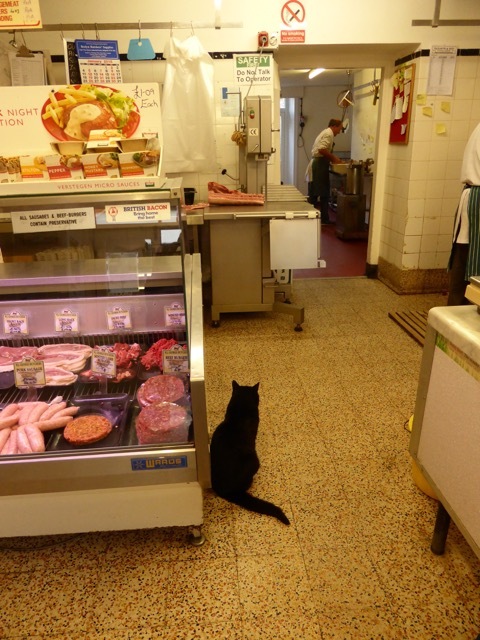 Shop owners keep pets as friendly mascots; here's the butcher's cat in Wales. 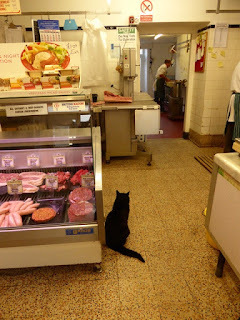 Now there's nothing specifically caregiver-friendly about a cat in a butcher shop, but I think it reflects a social flexibility and a general willingness to include everyone and everything in daily life. My Welsh friend and I chatted with the butcher and I learned that he is a bit of a town superstar on account of his wit and his willingness to deliver special orders to villagers. No one leaves the shop without catching up on town news and a comparative discussion on sausages. But nowhere did I see a more inter-generational and inclusive community than in northern Spain. 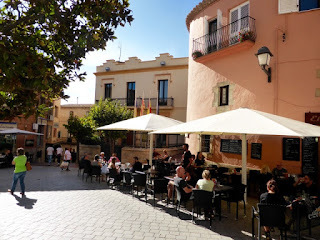 The village square was busy all day and late into the night with families eating, drinking, playing and socializing. Grandmothers balanced along the cobbles with their walkers alongside mothers with babies in strollers. Bored with adult conversation, children played ball in the square as toddlers dozed in fathers' laps. Dogs lazed under the tables or interfered with the ball games. I thought about how these traditions of community life that include whole families are ancient. Having dinner out in the community together with loved ones of all ages and abilities and including our pets is a deeply human activity. This coming Monday night, I'll visit my Mom and then drive her to my sister's house for a family dinner. It will be too cold to sit outside (they call for frost in Montreal this weekend), but we'll be together and I'll be thinking about ways we can build a Spanish style of relaxed inclusive family life into our North American communities.